I remember that day so vividly. I had walked up to him asking him to read something I had written in my diary. It was an essay about a place we had recently visited, written, after much prodding by my brother, who had come up with this supposedly exciting idea of a blog. The article was about his hometown, Haridwar, the place where his heart lay and this fact made me nervous because my own heart lay in the essay which I had tiresomely managed to come up with after hours and hours of scribbling and immersing my head completely in the diary. As he kept reading the story, line after line, I had eagerly gazed into his eyes intermittently trying to determine his response. What would he say? Would he like reading it or would he just brush it aside? His response was vital and important to me. He took his time, reading each and every word slowly; taking it all in carefully, pausing sometimes, reading this line again and then finally he spoke. It’s nice – he had said, looking straight into my round beaming eyes and in that moment his own eyes reflected in a gleam that could easily outshine the brightest star on the planet. Just two words and even before I could understand or analyse the depth of the appreciation, I felt them, deep in my heart. They were more than what was needed by me to jump in joy and ecstasy. I was overjoyed, partly because of his encouragement and more because I knew - I had impressed him! And thus began a new chapter in my life dipped in the pool of our friendship: Me and my first and best buddy, who gradually went on to don the hat of my inspiration and guide as well. He already travelled a lot, plans made at the drop of a hat, and he gladly made me a part of all of them – right from booking hotels to showing me new things, guiding me to places never seen and helping me open up to complete strangers on the road, people from different walks of life. Arti, every person you are meeting in life has at least one quality you are lacking. With your meeting, you are called to discover those qualities and imbibe them in yourself. With precious nuggets like these, he made every possible effort to help his little darling step out of her reserved shell. This is one of my hand drawn happy birthday cards for him a few years back. My dad always eagerly waited (still does) for these! Talking of learning, if there is one person I can converse with, as an absolute equal, it’s him. So we have talks on God, death, life and many other things where he puts his point of view and I put in mine. No matter how absurd my argument is, he has never gotten angry on me. Every time I have faced a problem or a dilemma, I have found a patient ear in him and his thoughtful advice and understanding perspective has been worth more than gold for me. He has been the most loyal and genuine critique and appreciator of My Yatra Diary..., doting on it all the encouragement, love and support that I guess only a father’s heart can give. He has taught me to value my ethics, morals and ideals over material needs and follow my heart in all that I do. He was the one who bought me a digital camera, my first and also the one that I continue using till date because otherwise... how could I write blogs that HE wanted to read? Through an unmasked, unpretentious honest way of living and interacting with people, he has tried to instil in both his children the love for the higher Supreme. It was our family rule, that if we children get lost anywhere during our travels, we just had to stand our ground wherever we are and our parents would come and find us. Every time I lost my way, I had no reason to worry as I knew my father would come and find me. And he did. Every single time. I think he tried to inculcate in his children the basic truths of life in the simplest way possible. As I have grown older, there are instances where I feel lost in the maze of life. It’s then that I close my eyes when I find the true resonance of this rule – Don’t worry, you are safe, father will come and find you – as an assurance that hope and faith are just a thought away. Like a potter moulds clumsy lumps of formless clay into a work of art, he has shaped my thoughts into structure and made me the person I am today. If there is only one thing I could ask God, I would pray for the strength and elegance to be like him. I wish to be more of his man in my woman in the years that are to come. Which I know is pretty tough for an asking because of the sheer simplicity that he is, in his being. The thorough gentlemen people talk about, a daughter’s hero, the old fashioned kind, a daughter’s first love and the best. Jotting down a few sketchy memories through this simple post seems shallow to be passed off as a gift when compared to what he has done for me all his life but here it is, papa – thank you for everything. For holding me safe in your arms and for always being there for me even when I wasn’t available for you. Thank you for giving me the priceless gift of belief at a time when I didn't have it for myself. You may not be perfect and even though we have our share of disagreements and differences, please know that you are and always will be the best for me. Thank you for being who you are and for accepting and loving me as the same. Thank you for giving me your little finger to hold, walking through life has been a joy ever since. Even though this post is primarily dedicated to my dad but it really goes out to all of you… countless father figures like him who take care of innumerable hearts of all us daughters out here. They say behind every man’s success there is a woman, I say – behind every daughter’s success, there is a father and I feel incredibly blessed and grateful to have been blessed by many fathers throughout the 7 year tenure of my blogging journey. Thank you for affirming our faith in this beautiful relationship by cherishing it as it was always meant to be … raw, pure and heavenly … without any strings attached except those that pull the chords of the heart and create a beautiful symphony of love and life. All of you mean so much to all of us, especially to those who might not have a father figure in their own life, for you make a difference, you help us all spread our wings and fly and make this world a little better, safe and beautiful to live in. You have beautifully brought out the relationship that is based on the universal binder Viz. love. I liked it so much Arti..! This post actually summed up a lot of emotions and feelings that most of the people don't express to their fathers. It's a bond beyond expectations and selflessness. A bond that's incomplete without an unexpressed relation of admiration. A bond more than a life in itself. So glad I read this today. Thanks, Arti! Direct from the heart, Arti! So endearing! Our Dads really make so much difference to our lives. Ever grateful. May God bless them! Belated Father's Day wishes to your dad. A beautiful post! I am sure your father too would be equally proud to have a daughter like you, Arti! That is so nice that your father is your best friend and you travel together. I was very close to my dad as well, but I lost him when I was only 28. He remains in my heart always. The hand drawn card is sweet, and this was a special Father's Day post. I could relate with you so easily and not only daughters even for sons alike father is a great figure of inspiration and while reading your relationship/friendship/bonding with your dad, I was thinking about my own. Being differently abled, father’s support is indefinable and he’ a hero who fights along with me for my day-to-day life. Though he isn’t an enthusiastic traveling unlike me, he supports fully on my passion for travel. I don’t need to say how difficult for someone in a wheelchair to travel and his and my mom’s support is truly based on love. 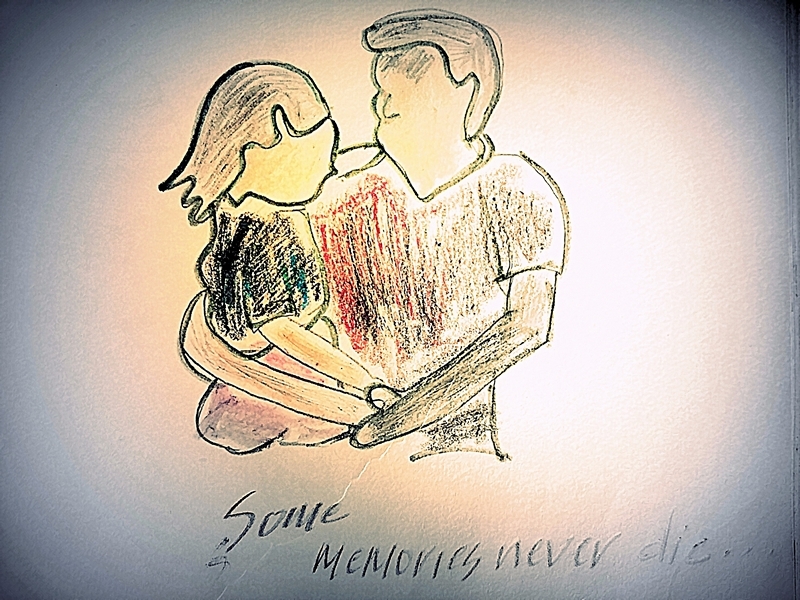 Lovely post and sketching for your dad... wish u always remains his darling daughter. Beautiful, Arti. I loved reading about your father and the special relationship you share with him. That card is lovely. A very beautiful post. I think today I promise myself to travel more often with my papa. He is my brest friend and my strength. But, yes we need to do some soul building things together. Thankyou for the post Arti.